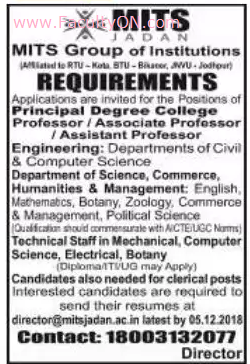 MITS Group of Institutions, Jadan has advertised for recruitment of Professor / Associate Professor / Assistant Professor / Principal Plus Non-Faculty jobs vacancies. Interested and eligible job aspirants are requested to apply on or before 05th December 2018. Check out further more details below. About College : Mahaveer Institute of Technology & Science (MITS), Jadan established under the aegis of Vidhya Jyothi Trust (VJT), Chennai, is the institute that came up realizing the void in technical & professional education in the region. The founders envisioned to contribute to the growth of the region based on quality technical education by creating learning & career opportunities for the youth.